Tag Archives for " Facebook pages "
Since last week’s sweeping changes to Facebook Pages people have been scrambling to unearth all the little tricks that the new format affords. A couple factors come into play when considering a marketing use of this real estate. 1) The images that make the top 5 are the last 5 by default, although if you remove one by hovering over it and click the X the next one in line jumps in. The images are displayed randomly with each refresh of the browser page. (Personal profiles show the images in a static order so some profile owners have gotten very creative with this space.) My guess is that the random display is being used on pages to inhibit the use of this space like a banner ad. 2) When clicked, images now expand into an ajax photo viewer right there on the page, complete with image description and any corresponding conversation about the image from fans. This is a much better user experience, but it also opens the door for some marketing plays. For the moment (all things with Facebook can change instantly) marketers are starting to use this space as a place to sprinkle in images with marketing calls to action. They then create offers or links to other pages and sites in the image description. You could certainly abuse this, but business pages have a little more leeway in terms of promotional messages and you can expect coupons, infographics, and free report offers to crop up in this space pretty quickly. The technical aspects of this are pretty simple. Facebook automatically creates a thumbnail for the wall. Your image and associated commentary will go into your news feed so it’s probably wise to go cautiously here and keep the promotion as low key as would be expected by your fans. This is great place to create awareness about content that may reside in other places. I also think you’ll want to keep this area fresh and rotate in new images and events and don’t always use it to sell! 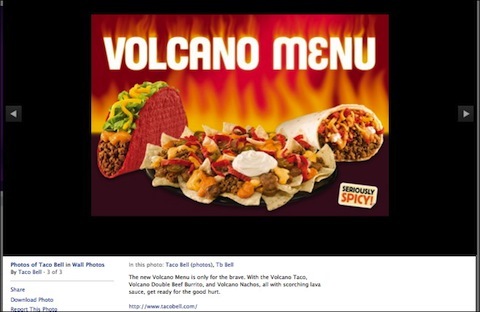 Yesterday Facebook rolled out what amounts to one of the biggest overhauls of the pages offering ever. I for one think the update is a major upgrade for businesses and brands using pages, but I know that app makers, custom page designers and people that have been using their personal page for business use are scrambling today. You can find more about the upgrade for Facebook pages here. While all pages will be automatically upgraded by March 1st, page admins need to activate the upgrade as it is rolling out across the network. You can see the status of your pages here. You might also want to grab the Pages Manual put out by Facebook. From an aesthetics point of view, I think the page looks cleaner as well. And now for some of the most important feature updates. There will be a ton of scrambling over this in the FB developer world as iframe allows for a great deal of flexibility for delivering content from your own pages and blogs as it basically goes out and grabs content designated in the frame. Most people may be familiar with this kind of code from embedding a YouTube video. It will also allow for things like lead capture and display of dynamic content without having to fumble around with all of Facebook’s mark-up. There are restrictions to iframe use and Facebook made some significant changes to Platform Policies, so make sure you understand these restrictions. Tabs (or do we call them apps since they aren’t really tabs anymore) have moved from the top of the page to the left sidebar. This seems to be causing some of the loudest objections, but I think it’s just a matter of getting used to it and I prefer it. The photo stream has move to the top in the ribbon fashion that was added to personal pages a few months ago. Again, I think I like this look and it certainly makes images a prominent feature. It appears that the default images are the covers for albums. Page admins can now be publicly displayed on the page by selecting edit info > featured. The profile picture size for Pages has been adjusted from 200 x 600 to 180 x 540. The editing function is much more logical and housed in one place rather than hidden under several rocks as before. One of the biggest business changes is the fact that you can use Facebook as a Page admin instead of just as your personal profile. 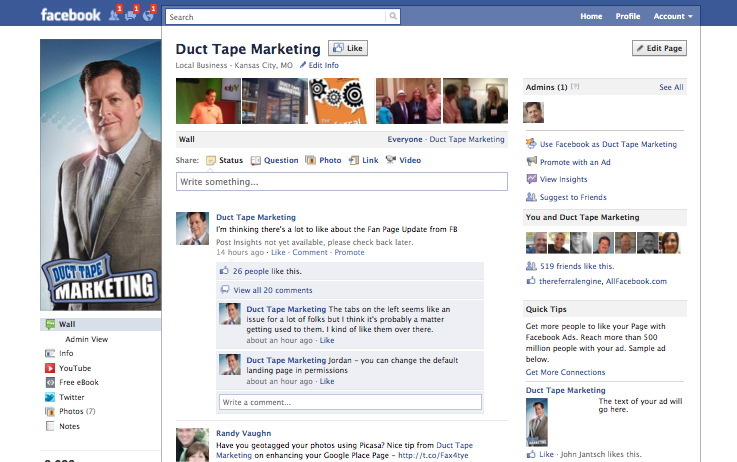 So if I like another page I can choose to comment there as Duct Tape Marketing or as John Jantsch. If you admin several pages you can select who you want to comment as. I think this has major implications for brands. You can flip back and forth and choose your identity through the Account tab in the upper right corner. One point that has a lot of folks up in arms is that the wall posts are no longer served in chronological order. Under the everyone tab posts are being served up in a what Facebook calls “relevant” manner. Not sure about this one sticking around as Facebook is now using some algorithm to determine which posts go to the top and my guess is some page admins aren’t going to like the fact that they don’t control the order of the content on the Wall. You can now choose in permissions > settings to get email (or sms) notifications when someone comments or posts on your wall or any of about 100 other things. You can prefilter profanity by selected a setting in manage permissions. You can choose up to five featured “likes” (other pages) to keep in rotation on your page. As is often the case with Facebook changes some will stick, some will go, and some will evolve, but on the whole, I Like!